In any sport the most high your individual and team's awareness in all required dimensions in your preparations and consistent successful execution at each stage during the competition the most guaranteed your winning of the highest and ultimate price of that competition. The soccer world cup Russia 2018 is one such competition where your team's win is most highly desired. To do this you need to make sure that as an individual and a team you are Aware of, Engaged to, Based in, Oriented by and Driven (AEBOD) on the same force of boldness and courage, experiencing-competency and actualising-values. You as the player or supporter of your country's national squad are the most crucial atomic element of the competition. What Generates Your Personal and Team Success in The Competition? Your collective mentally superior, emotional diligence and performance atmosphere will generate the ultimate success of your team. However, you should be the first one to supply mentally superior, emotionally diligent and performing atmosphere by your-skills-utilization to enable your-empowering-others in your national squad. What do you think would happen if each one of your players and supporter focussed on empowering others in different ways, including on the playing field. The net result is that there is no one amongst the players and the supporters who is not empowered. Everyone is empowered. Is this not a recipe for wining the soccer world cup 2018? Surely it is! Because everyone is performing at their most high capacity. What is the Root and Foundation of Your Personal and Team Performing At Their Most High Capacity? Your individual and team buy-in and commitment to the work ethic that generates the most high personal and team performance is rooted and founded in your matured personal qualities. Maturity is the extent to which each individual is possessed by as many personal qualities as possible all working in an interlinked and interconnected fashion. This combined maturity will personally and collectively generate the team's successful performance. 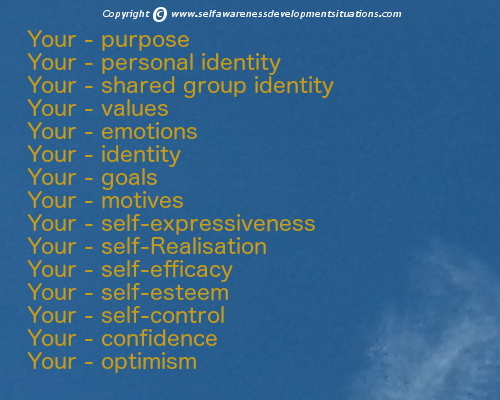 Now, these are many personal qualities to choose from. Start small. Out of these you can choose only three (3) of the qualities that you think go together - for example your-optimism, your-resilience and your-hope. Here is an example for you below that makes use of the interlinked personal qualities - your-empowering-others, your-skills-utilization and your-identity. There are three things you need to do with this combination in order to empower yourself before you can empower other players or supporters. 1) Speak this combination to yourself to develop mental superiority. 2) Meditate on this combination to reinforce emotional diligence and 3) Do the actions to perform and produce personal and team success. Go back to the list of personal qualities and choose a different combination of 3 again, then perform the 3 step process suggested above. 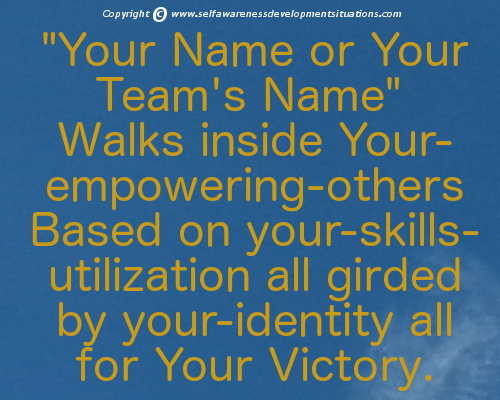 Verbalize Your Individual And Team Commitment to Win!